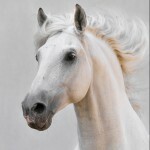 If there is a strong, foul smelling odour coming from your horse’s feet, particularly from the sole and frog area, your horse may have thrush. Thrush is a degenerative infection of the grooves within the frog. It is usually caused by standing in wet, dirty bedding or for lengths of time in a wet field. Less commonly, a horse may have poor foot conformation with a compressed groove in their frog which harbours bacteria and can often become dirty and infected if not brushed out and cleaned regularly. Sometimes horses may become unsound if the thrush is not treated so, it even in mild cases, it is important to have a treatment strategy. As well as the pungent smell you may see dark or black areas on the sole and around the frog. The frog itself may have softer spots and appear irregular in shape in more advanced cases. There are a variety of treatment methods according to the severity of the infection. First, ensure your horse is moved to a clean, dry area and pick feet on a regular basis. It is worth thoroughly scrubbing feet with warm water, drying as well as you can and applying an antibacterial product. 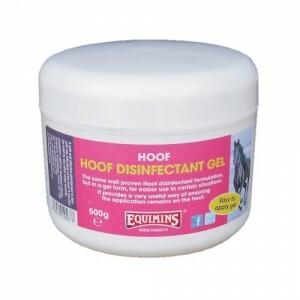 Hoof Disinfectant would be a useful addition to your hoof care regime here. If the thrush is more severe, a visit from your vet or farrier may be necessary. Prepare your horse’s feet by picking them out and scrubbing with water. Leave time for them to dry in a clean stable. Your vet or farrier may trim back the frog to remove all dead or damaged tissue before applying a treatment. This may sound quite an intensive method, but in many cases if thrush is managed and treated quickly, further treatment isn’t needed.